Recently, a good friend asked me to help out to make a not-so-sweet birthday treat for her son. I was, of course, delighted but I had never made strawberry shortcakes before. I figured, how hard can it be? Let's give it a go. It didn't take me very long to realize that they are, in fact, quite easy. So easy even you can do it. So, if you're looking for the perfect dessert to follow a sunny grilling extravaganza with friends, these light, berry-licious, comforting shortcakes are just what you want. * I use a combination of 1/2 cup white sugar and 1/4 cup brown sugar because I like the flavor that brown sugar imparts to baked goods. You can, however, use all white sugar if you prefer. Approximately 6 cups of berries: strawberries, blueberries, blackberries, raspberries... this is where you can really get creative and play slave to your taste buds. Pick what you love, then add about 2 heaping tablespoons icing sugar to the berries, the juice of one lemon, and a dash of cinnamon. Mix it all together to allow the sugar to pull the juice out of the berries to create delicious, juicy macerated berries. Preheat oven to 375 degrees. In a food processor, pulse together the dry ingredients. Add the frozen butter pieces and pulse until the mixture resembles coarse meal with pea-sized bits of butter remaining, about 10-12 times. In a medium bowl, whisk together 1/2 cup cream and the 2 eggs; pour over the flour mixture and pulse until the batter just comes together. *I use frozen butter pieces because I like the biscuits to be flaky and fluffy. You can, of course, use butter from the fridge. The point of using the food processor, instead of your hands to bring this dough together, is to keep the butter cold and not blended in fully. These biscuits, much like pie, are made flaky by the butter not binding completely with the flour so when they bake the butter melts and reacts, puffs up to create delicious flaky pockets. Overworking the dough with your warm hands will often create a dense, heavy biscuit. So... the key is to keep the butter cold. Using a cookie scoop, measure out the dough onto a parchment-lined baking sheet. Bake until lightly golden, about 12-14 minutes for minis (~20 minutes for larger biscuits). Transfer to wire rack to cool. 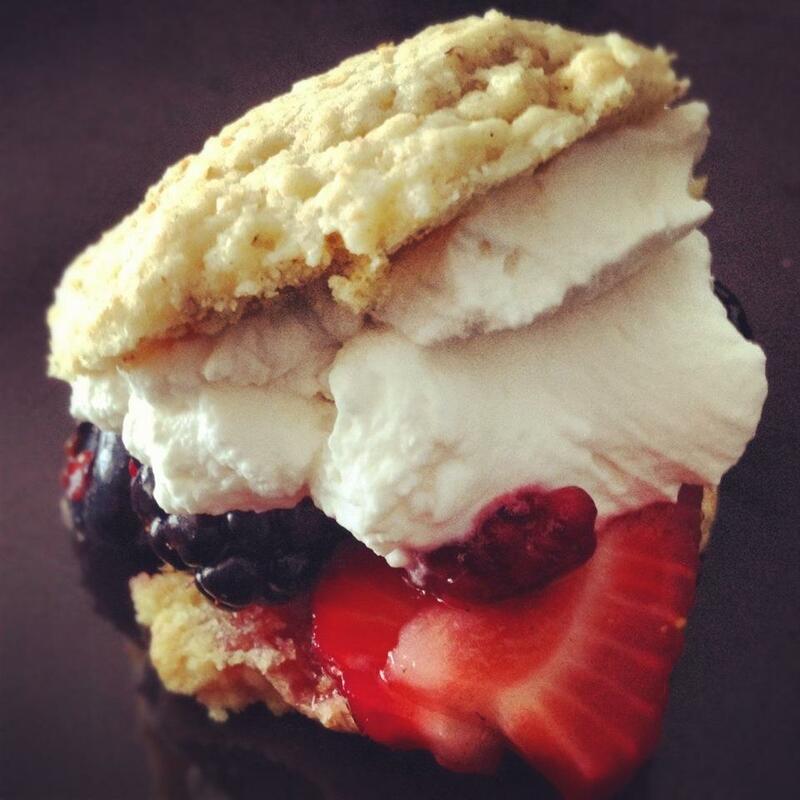 To serve, gently slice open the shortcakes with a serrated knife. Spoon berries and their liquid over the bottom halves. Then, top with whipped cream and replace the top halves of the biscuits. *To make the whipped cream, pour whipping cream into the bowl of your mixer fitted with the metal whisk attachment. You can, at this time, add vanilla and a bit of sugar to transform 'boring old whipping cream' into the much more posh Chantilly Cream... ooooh chantilly cream?! Start your mixer about about 4 or 6 and increase speed as the cream begins to thicken. You're all done when soft peaks form, chill in the fridge until ready to serve. Now, you could serve strawberry shortcakes to your friends; I have nothing against the traditional, and still very delicious dessert. Or, you could float in through a waft of smoky BBQ, the sun shining down, cold beverages dotting the table strewn with empty plates and satisfied smiles to tempt your guests with fresh shortcakes topped with macerated summer berries and Chantilly cream. Go ahead, do it. You'll become a domestic goddess in 2 seconds flat.